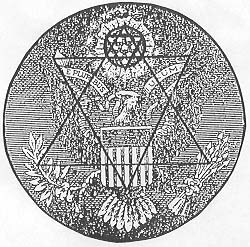 There are two hidden hexagrams surrounded by a circle within the Eagle Seal. The larger hexagram is formed with the top star forming the pinnacle of the first pyramid and a point within the olive branches on the one side and the cluster of arrows on the other forming the left and right bottom points of the triangle. The inverted triangle has its pinnacle in the middle white panel of the shield, with the actual point at the top middle of the tail feathers. The left and right points of the inverted triangle were formed at the extreme edges of the unfurled ribbon bearing the words, "E Pluribus Unum". Of course, the circle is formed by the design of the Great Seal itself. lines. Experts have argued for decades about why the stars were formed in this most unusual manner, with no author knowing the precise reason. Now we know why this unusual arrangement was selected. Thus, we have two hidden, embedded hexagrams surrounded by the necessary circle to create the demon trap. From the beginning of our country, witches could consistently conjure up demons on behalf of the United States of America to work for the New World Order. But, there is even more hidden embeds within these two symbols: Each hexagram has six (6) points; therefore, since these two Great Seals contain three hexagrams, we have the Satanic number, 666, created. Now you can easily see how brilliantly these two Great Seals were created. Clearly, their authorship had to be demonically supernatural, since they are clearly outside the boundary of human ability or comprehension.